(Ram drive) Ram is a method used to enable the operation of some systems and programs by using the memory of the deleted memory without making fast and hard disk installation. Full operation The RAM is a part of the memory that is separated by retaining the memory of the temporary files. The most important detail in this system, which reads up to 3000 MB / sec, is that the files in ram disk space will be deleted when you restart your computer. How to create a Ram disk? When creating a ram disk, it is necessary to use 3rd party software and create a temporary ram disk by creating a space in the windows operating system, which is the operating system or another form of ram disk type that is booted with ram space by using these software. 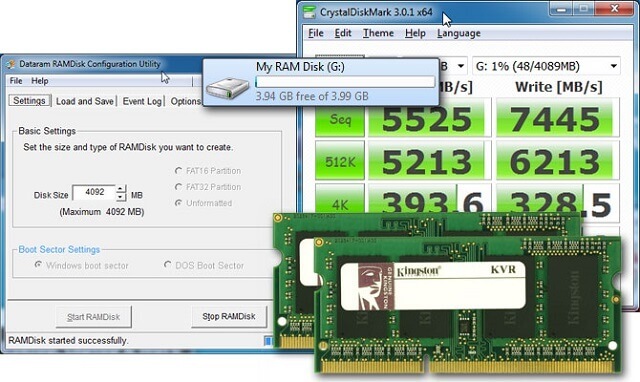 All ram disk creation is done with software or tools. You can install many applications quickly and use these applications 50 times faster than the normal disk, but still all data will be lost after the restart if we think that some applications should be used with caution.